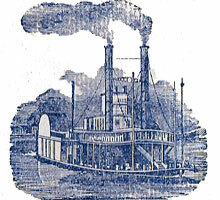 Owing to the romantic appeal of gambling on the Mississippi river, from the 1870s onwards many American playing card manufacturers added “Steamboats” to their range, differentiated by a number, such as 99 or 999. 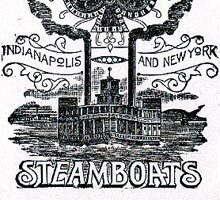 There do not appear to have been any copyright restrictions or patent laws covering the use of the name “Steamboats” as various manufacturers had this brand in their range. This is not the case with other brands such as “Bicycle” or “Bee”. “Steamboats” tended to be the cheaper end of the range, often but not always produced in a rudimentary quality. 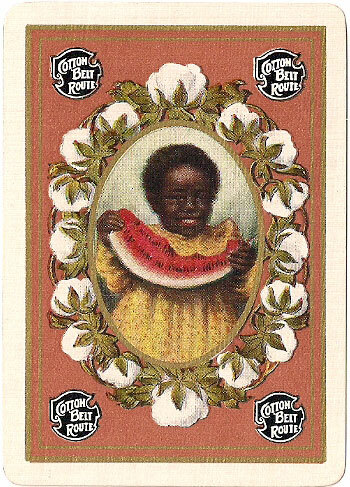 The theme of steamboats navigating up and down the Mississippi also extended to the cotton plantations alongside the river and to African American people employed therein who were sometimes depicted on the special Joker card. 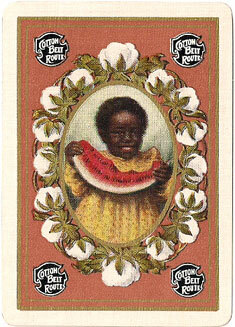 Times have changed and these cards are now documentary evidence of a past era of history. Above: a slightly later edition of 'Steamboat No.999' playing cards produced in three colours by the United States Printing Co (Russell & Morgan Factories), Cincinnati, USA, c.1891. The Ace of Spades now has the number 999 but not the title “Steamboat” although the image of a steamboat is evoked. As an indication of just how widespread the the “Steamboats” brand was, other manufacturers who produced their own versions, but which are not yet shown here, include the following: Lawrence & Cohen; Samuel Hart & Co; John J. Levy; Victor Mauger; Globe Playing Card Co (c.1880); Perfection P.C. Co (c.1885-90); Andrew Dougherty (1888 and c.1910); Card Fabrique Co (1886); American Playing Card Co (c.1887); Excelsior Card Co (c.1895); Chicago-American Card Co (c.1895); Shakespearian P.C.C. (N.Y.C.C. c.1895); North America Card Co (1897); Crescent Playing Card Co (c,1900); Dorrity Card Manufacturing Co (c.1903); New Chicago P.C. Co (c.1903); Bay State Card Co (c.1900 and c.1905); N.Y. Consolidated Card Co (c.1890 and c.1910); St Louis Playing Card Co (alias Kalamazoo P.C., c.1905); Standard Playing Card Manufacturing Co (c.1890 and c.1900); Universal Playing Card Co (alias Kalamazoo P.C., c.1911); American Bank Note Co; Russell P.C.C. ; the Canadian P.C.C. (1914) and Montreal Litho, making a total of well over 30 different versions. About three year ago, U.S.P.C. discontinued the brand. However, a private vendor obtained a special arrangement with U.S.P.C. whereby the brand is again in production but available only through the vendor who trades on the internet as www.dananddave.com. As a final souvenir from that bygone era, this deck also relates to the cotton plantations that were located in the States through which the steamboats travelled on their voyages up and down the Mississippi River. Above: this Cotton route deck published in 1903 by St. Louis Southwestern Railway Lines is a standard deck with advertising only on the box, back design and coordinated Joker. Accordingly, the deck was used for regular play. To find a specimen in excellent or mint condition is therefore a rarity. This specimen is gold edged. It was the romantic mystique surrounding the gambling that regularly took place on the Steamboats and the folklore that built up around legendary Mississippi gamblers that card makers exploited in this very popular brand of playing cards. The evocation of the life in the steamboat era provides a melancholy reminiscence of that bygone age.